﻿ 4 Tricks to Boost Your Email Click-Through Rates » Red Mango Marketing! 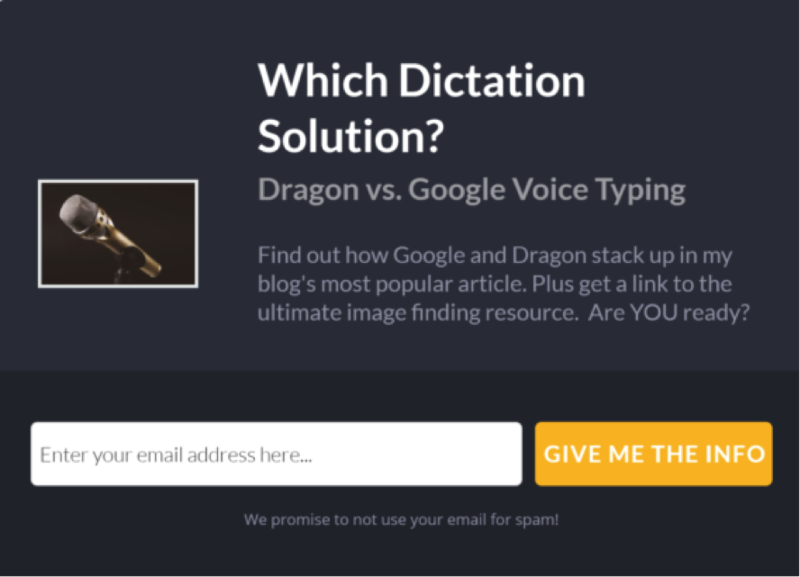 Want to know how to increase the click-through rate of your emails? To increase email click-through, you need to nurture your list. Email nurturing is essential because no one wants to engage with an email sent by a stranger. On average, 13+ promotional emails are hitting the inbox of your subscribers daily from various brands. It goes without saying that if you don’t build a relationship with your subscribers, it is hard to get your emails noticed, let alone receive clicks and engagement. 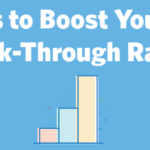 Let’s take a look at a few tricks that could help you boost your email click-through rate. Creating a sense of urgency (the scarcity principle) is the best way to persuade your leads to engage with your emails. Urgency works because when you put a deadline on a specific action like the purchase of a product before an offer ends, people automatically lean towards taking that action by engaging with your email. Litmus’ email campaign is a perfect example of using urgency to drive people to complete an action based on urgency. 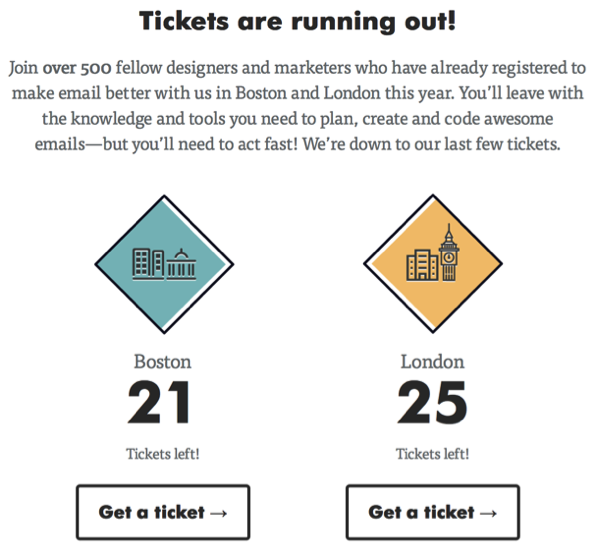 It persuades users to purchase tickets before they get sold out by showing the exact number of tickets that are left for the event. There are two types of urgency you can make use of in your email marketing campaigns: time-based urgency and scarcity-based urgency. Time-based urgency entices prospects to engage with a campaign by providing only a limited timeframe. Whereas scarcity-based urgency capitalizes on scarcity to make it work just like the Litmus example mentioned above. The best way to improve email click-through rates is to send more personalized emails to your leads. When emails are personalized on the basis of your individual subscriber’s unique behavior and interests, they are more likely to engage with your emails. Now, it’s next to impossible to manually personalize emails. This is where segmentation comes in. Email segmentation allows you to classify your leads on the basis of common interests and behaviors. This way you can send targeted emails to each individual group addressing the needs of their concerns and behaviors. Email segmentation isn’t scary as it seems to be. With a tool like OptinMonster, one of Constant Contact’s integration partners, you can easily build a hyper targeted and segmented email list based on visitors’ location and user activity. Combining with its exit intent technology, you can rapidly grow a hyper segmented email list by prompting a targeted popup form to abandoning visitors at the precise moment they’re about to leave. Educate your leads: Let’s say you recently launched a mobile app. Based on users’ activity, create a segment of leads who probably didn’t know it existed. The idea is to teach a subscriber what they mightn’t know about your product or services. Notify your customer about an activity: For example, if a customer recently added a product to the cart but didn’t complete the purchase, you can notify them to complete the purchase. Send product recommendations: Send a personalized email promoting products that you know your leads are more likely to buy. Sending too many emails can be annoying to your potential customers, which makes them unsubscribe from the list. To make your list active and to boost click-through rate, it is essential to know your subscribers’ email preferences. You can ask your subscribers how often they wish to receive your emails and the types of email they want to receive from you. This way, you can ensure that you’re not annoying your leads, keep them longer on your email list and more importantly, keep them engaged with your emails. 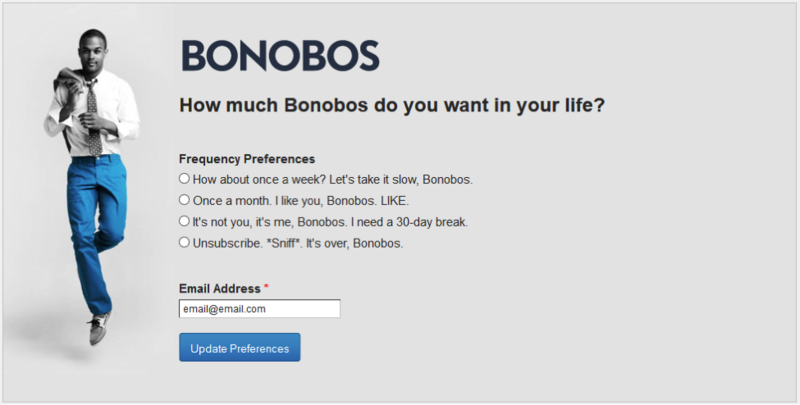 By asking email preferences of subscribers, Bonobos maintained strong user engagement ratios, sent 2-3X more emails to highly engaged contacts and also increased engagement with lower-engaged contacts due to reduced frequency. The harsh reality of email marketing is that an average of 60% of email lists are full of dead email subscribers. 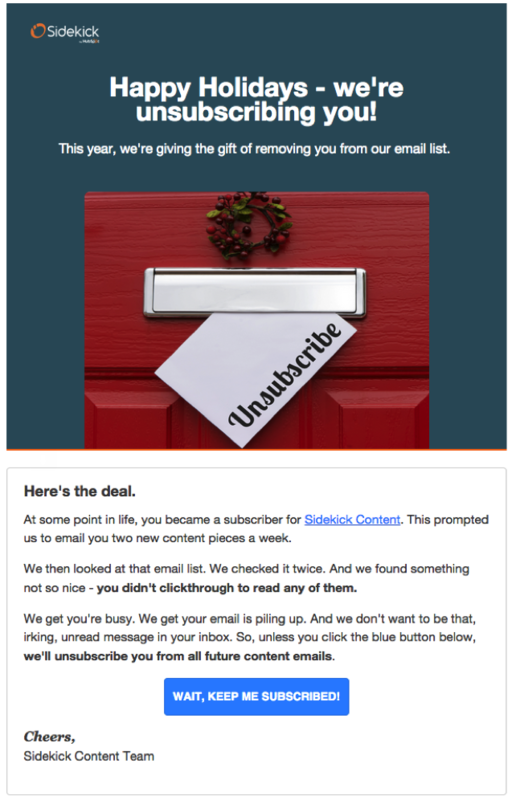 Since every subscriber is costing you, you need to make your list active by regularly cleaning up your inactive emails from the list. Additionally, having a high number of inactive leads can even adversely affect your email deliverability and cause your emails to be delivered to spam. Before you clean up your list, you need to take the last step to make your leads re-engaged with your emails by creating a win-back email campaign. According to a study, an average open rate of win back emails is 12%. This rate is respectable since all leads were identified as inactive before. One of the best ways to persuade your inactive leads to engage with your emails is to make an offer they can’t refuse. Another strategy to make a list engaged is to send an unsubscription notice to your leads who haven’t engaged with your list for a while. In addition to unsubscription notice, Sidekick also provides an option to users to remain in the list by clicking the ‘Keep me subscribed’ button. If you feel that you could do better, you can follow these recommendations to boost your click-through rates. What is your favorite trick to boost email CTRs? Let us know by commenting below! The post 4 Tricks to Boost Your Email Click-Through Rates appeared first on Constant Contact Blogs. This entry was posted on Tuesday, October 17th, 2017 at 8:00 am	and is filed under Email Marketing, News & Updates. You can follow any responses to this entry through the RSS 2.0 feed. Both comments and pings are currently closed.